This dialog allows you to add predefined fields to your conversion, or remove ones you've added already. 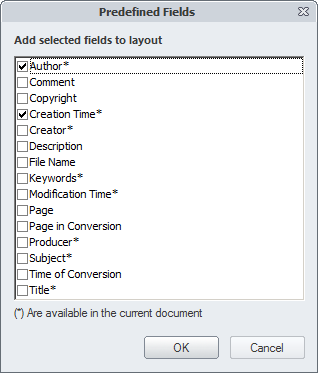 In this dialog you can see the list of all predefined fields which are available for the current document, and you can check whichever fields you want to include in the conversion and uncheck the rest. All predefined fields are unchecked by default. You can read more about predefined fields here.